Serbian center bought himself some fresh new vehicle. 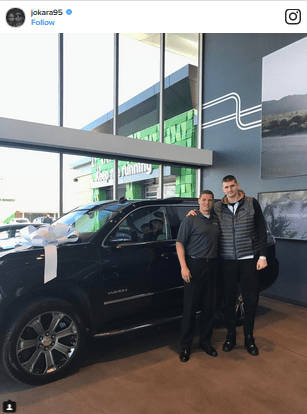 Nikola Jokić after series of successful games wich made him a leader of Denver Nuggets decided to buy some hell good vehicle which is pretty expensive pleasure. Serbian national team player decided for a Jeep GMC Yukon wich costs about 63.500 dollars. This powerfull machine which Serbian As now owns, has even 420 hp. It is spacious and big and that makes it ideal for Serbian center which is 211cm tall. Powerfull engine, besides the size, makes it go fast up to 100km in 5.8 seconds, meanwhile it’s top speed is generated in the engine of the car 180/h. You can see in the photos how does look the inside of Jokić’s new car and how it looks when he is riding on the road. With no doubts, Jokić will enjoy it as much as he enjoys playing on the basketball ground.